At birth the doctor said they wouldn't live past two, sixteen years later Grace and Tippi are still here, still together. Grace and Tippi are twins who are conjoined at the hip. "They share everything and are everything to each other." They are one, and cannot imagine a life any other way. "But something is happening to them. Something they hoped would never happen. And Grace doesn't want to admit it, not even to Tippi." Crossan's novel about conjoined twins is interesting beyond the fact that its main characters are joined at the hip, it is written entirely in free verse. I've never read a novel written in free verse, the idea always left a bad taste in my mouth. Maybe too much Shakespeare when I wasn't mature enough for it yet. Anyways, this book made me smile, it made me think, and it made me sad. These girls, although conjoined have very different personalities. Grace loves books. She is quiet, thoughtful, and she sees the world through her emotions and feelings. Tippi loves to listen to music. She is outgoing, sarcastic, and less likely to care what others think. With Grace as the narrator, the story follows the girls through the ups and downs of going to public high school, their few good friends and their experiences as teenagers. While dealing with their new experiences at school Grace and Tippi's home life is hitting some bumps as well. Their Mom is having to deal with cutbacks at work, their unemployed Father's drinking problem is starting to show, and the girls notice that their sister is having issues of her own. Things get even rougher when the girls start experiencing health problems. This book had many ups and downs. 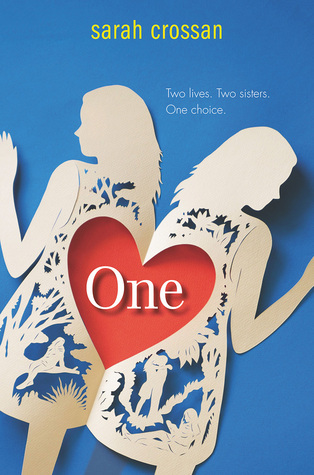 I enjoyed reading about the girls experiences and found myself not thinking of them as conjoined twins, but as two people experiencing the same things, but having different thoughts, feelings, and reactions. Crossan's writing and style really shined throughout the entire book. I felt she conveyed such strong powerful emotions with very few words. Ms. Crossan you have made me a believer in free verse novels. Thank you.